SAN FRANCISCO: Zero fossil fuel energy, zero gas-guzzlers on the road, zero waste, zero CO2 emissions — dozens of cities, regions and companies made “zero” pledges Thursday at a global climate summit in San Francisco. 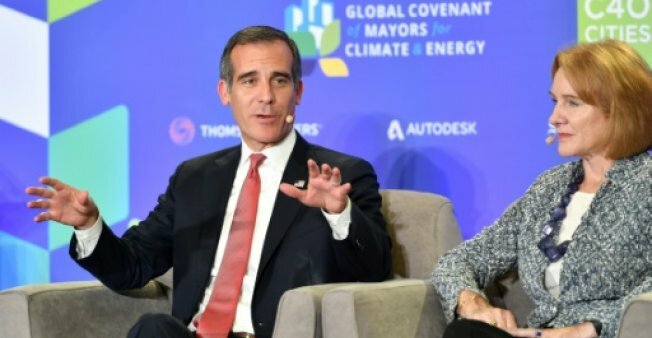 The mayors, governors, and CEOs from around the world have stepped into the climate breach with concrete action as UN talks to implement the Paris climate treaty falter, and President Donald Trump dismantles US policies to curb greenhouse gas emissions. Global warming, meanwhile, continues to gather pace: major storms bearing down on the US eastern seaboard and the Philippines, and wildfires ravaging California, bear the unmistakable fingerprint of climate change, scientists say. “This is real and we will take action even if Washington doesn’t,” said Los Angeles mayor Eric Garcetti. Jointly organized by California governor Jerry Brown and former New York mayor Michael Bloomberg, the three-day gathering is a showcase for initiatives, big and small, to reduce humanity’s carbon footprint. Many center on switching from cars and trucks powered by planet-warming fossil fuels to electric vehicles. On Thursday, dozens of states, regions and major cities committed to allowing only zero-emission cars, buses and trucks on their roads within a few decades. Tokyo, Seoul and Rotterdam, meanwhile, joined Paris, London, Barcelona and Mexico City in vowing to run only electric buses by 2025. Even a decade ago, such commitments would have seemed unthinkable, said Nicholas Stern, who heads the Grantham Research Institute on Climate Change and the Environment in London. “Who would have thought that the heads of major car companies would all be agreeing that the era of the internal combustion engine is coming to an end,” he told AFP. In the United States, vehicle emissions are the single largest source of greenhouse gases. Electricity grids around the world are also purging fossil-fuel-based energy. Brown signed legislation this week committing California — the fifth largest economy in the world — to 100 percent clean electricity by 2045. He also penned an executive order mandating net-zero carbon emissions throughout the state’s economy by 2045. “That is the most ambitious goal of anywhere in the world,” he told AFP. Brown had tough words for Trump, who yanked the US out of the landmark Paris Agreement and is trying to rescind California’s right to set its own vehicle emissions standard. His actions “border not only on insanity, but on criminality,” he told journalists. “Liar, criminal, fool — take your choice,” he added when asked what Trump’s environmental legacy would be. Bloomberg, who leads the C40 climate-centered coalition of big city mayors, noted many of the policies affecting carbon pollution are local. “In the US, the decisions that have the most influence over greenhouse gas emissions are not made by the federal government,” he said. Entertainment and electronics giant Sony Corporation committed this week to running its global operations only with renewable energy, joining more than 140 multinationals — three-quarters of them having pledged to do so before 2030. “This is part of our ‘Road to Zero’ initiative to eliminate our environmental footprint,” said Sony President and CEO Kenichiro Yoshida. Also on Thursday, more than two dozen cities that are home to 54 million people announced that their greenhouse gas emissions had peaked. Scientists have calculated that global emissions need to peak by 2020 to avoid the worst ravages of global warming, including deadly heatwaves, droughts and rising sea levels. At least one head of state at the conference has followed suit. “We are in a fight for our own existence,” said Barbados Prime Minister Mia Mottley.